Khmer Girls in Action (KGA) empowers young Southeast Asian women with an eye towards individual, political, and cultural transformation. 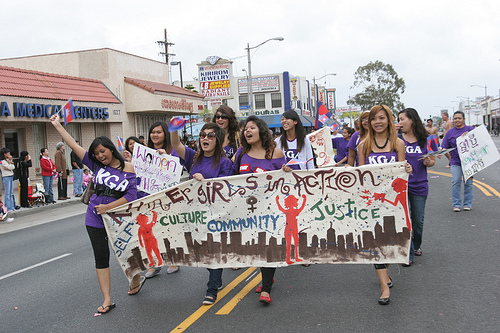 KGA began its life in 1997 as HOPE for girls, an empowerment-based reproductive health program for young Cambodian (or Khmer) women in Long Beach, CA — the location of the largest Cambodian community in the US. A sexual harassment campaign, sparked by a comment from a school teacher towards on of HOPE’s members, launched the group into the world of organizing. Eventually KGA split off from its parent organization, Asian Pacific islanders for Reproductive Health (APIRH).